I’m sure the discussion of college and how to pay for it has come up many times with parents and students alike. And college education is only getting more expensive in the United States. A CNBC report says that “Students at public four-year institutions paid an average of $3,190 in tuition for the 1987-1988 school year, with prices adjusted to reflect 2017 dollars. Thirty years later, that average has risen to $9,970 for the 2017-2018 school year. That’s a 213 percent increase.” There is another cost-effective alternative to attending a US college or university and it would definitely be a great adventure. Save money and gain international experience by attending university in Europe. As someone who received an MA degree from a European graduate school, I highly recommend it. There are over 300 schools in Europe offering 1,700 full degree programs conducted entirely in English. 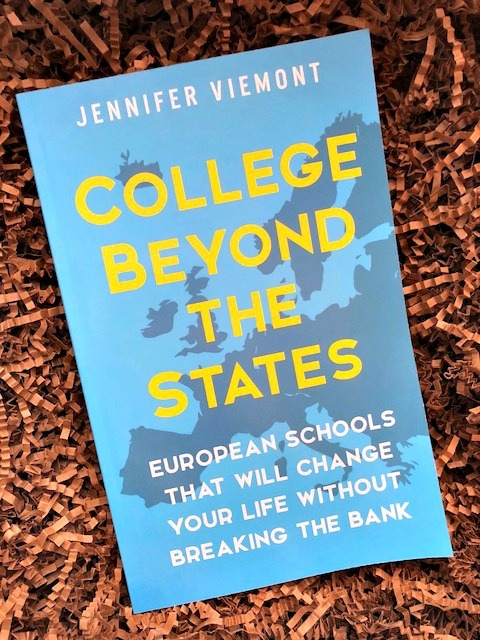 College Beyond the States: European Schools that Will Change Your Life Without Breaking the Bank by Jennifer Viemont guides families and students on the viable options that are practical and affordable. “There are almost 400 programs with tuition less than $4,000 per year and fifty options that are tuition-free—even for international students,” Viemont explains. College Beyond the States provides details on the top 13 European schools. They all offer high-quality bachelor’s degree programs taught entirely in English. The programs offer reasonable tuition fees below US costs, attainable admissions requirements, and excellent international student environments. This extensive resource is filled with diligent research compiling great information. The benefits of attending college in Europe are vast. It includes the financial advantages, social and cultural exposure, and a diverse range of internship opportunities. Also, there are chapters detailing various European colleges and universities. They focus on the amount of English-taught programs available, average annual tuition costs, application periods, scholarship information and more. If you’re seeking alternatives to expensive colleges in the US, check out College Beyond the States. The book and organization will give you the best foundation to begin planning your studies abroad. Jennifer Viemont, the author and founder of Beyond the States, has planned two Beyond the States Virtual College Fairs. They’re scheduled on October 20-21 and January 12-13, if you’d like to know more about college in Europe. The scheduled Virtual College Fairs will include live representatives from top European schools. Take a look at the website below for more information.